Food, treats, foraging & training toys, spacious cages, accessories & supplements to keep your Large Macaw Parrot healthy & happy. Fantastic selection of food & treats, toys, stylish & spacious cages, stands, accessories and supplements to keep your Large Macaw Parrot healthy and mentally stimulated. Enjoy browsing our collection of products for Large Macaw Parrots. Free Delivery on Order Over £39! All in stock and ready for dispatch. Your Large Macaw may be one of the popular species like the Blue and Gold Macaw, Green Winged or Scarlet Macaw. Whether you are a new or experienced pet owner, you know that providing the right diet for Large Macaws is extremely important. We have a superb collection of Large Macaw food, made specifically for your bird! Choose from yummy high-quality seed blends and tummy friendly high performance granules that will keep every Macaw healthy and nourished. Our range of foods contains a tasty blend of seeds, berries or pellets to keep your feathered friend happy! In addition to your Macaw's diet you can use treats, simply just to show how much you love your parrot, to teach them tricks, or to add to their main food for increased variety! Sometimes your Macaw needs different taste and texture. Perfect for any time of the day, these treats are packed with great bird-friendly vitamins and minerals that are a great source of nutritional value. When your bird is being tough about their food, you can always supplement and ensure your bird is getting all the vitamins and minerals they need. Our selection of health supplements range from multivitamin drops to natural homeopathic remedies. Supplements not only adds to your Macaw’s nutritional requirements but also promotes healthy skin and feathers! A fit and healthy Macaw means it’s an active one! Being that your bird is active, you can easily keep them entertained with toys and interaction throughout the day. Not only will you be exercising their body, but their mind as well with mentally stimulating toys and games. We carry anything from Birdie Bangles to foraging Hide n Seek toys. Your macaws are in for a delightful round of entertaining games while in their own home. Since your Macaw has toys and extra accessories, a spacious cage is ideal and provides a safe home for your bird. Our selection of cages are made from strong and lightweight materials, but strong enough to house a macaw. They’re designed to provide your macaws the most comfortable home possible! In addition to providing a cage, think about a Parrot play gym or stand so that your bird can play and stay safe outside of their cage. Add in extra accessories with our fun variety of specially made perches or essential items like the Compact Bird Lamp that promotes healthy bird eye sight or cleaning supplies for your bird’s cage! 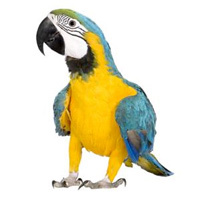 Rest easy knowing all the products your Large Macaw needs, is right here at Parrot Essentials.